No it isn't the city (Cairo) and it isn't the syrup (Karo)! Kairoi, pronounced (ki̅-roy), comes from the Greek root word kairos and means a season of time, an opportunity. Kairoi, Inc. is a web development company that exists to create opportunities! We opened our doors in February, 2004 and have enjoyed providing online solutions to our clients. Over the past years, our primary focus has been churches, non-profits and small businesses. However, we would be happy to talk with you about any web related project! Make sure to check out our work! Shannon Arne is the president of Kairoi, Inc. He has been involved in web related technologies since 1998. 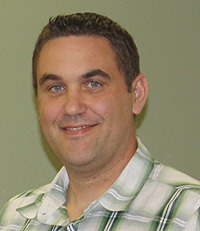 In addition to his technical career, Shannon is a credentialed minister with Open Bible Churches. In his spare time, he enjoys spending time with his family hunting, hiking, boating, and camping along the Missouri River. We will work with you to ensure you are happy with your website, from start to finish. This technology will resize your website to medium, whether phone, tablet or computer. Using ASP.NET allows the owner of the website to update aspects of the website in a secured admin area. SQL can be used in conjunction with ASP.NET applications or for standalone projects. Take a look at some of the work that we have done. We can use something you like below as a template or custom build to your specifications. Whether you have some general questions or you are ready to employ our services, we want to create opportunities for you. Use the form below to begin the journey today.